For my birthday last week, Suzy bought me a SteakStones set which consists of a bamboo tray, a rectangular plate, three tiny glass bowls and a piece of lava stone. You put the lava stone in the oven for about 20 minutes before transferring it to the tray, where you then cook your steak or fish directly on it. I’ve not had chance to use it yet, but will try to post some pictures when I do. 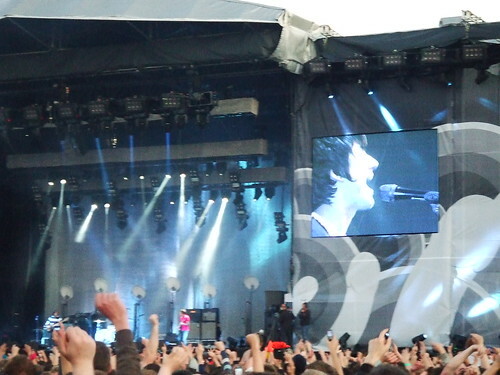 As part of my extended birthday celebrations, I then went to watch the Arctic Monkeys gig at Lancashire County Cricket Club on Sunday. (That’s “Old Trafford” for normal folk like me who don’t know its proper name!) Fortunately for us, my mate Caz’s brother had decided he didn’t want to go, so we bought the two spare tickets last month. Until two days before the gig, I had no idea that the event started and 14:00 and was presently surprised to find out that not only were the Sheffield Monkeys being supported by Amy Winehouse (who I’m not really into) but they were also being joined by The Parrots (who are a Japanese Beatles tribute band), The Coral and Supergrass. Since we didn’t get a chance to go to Glastonbury this year due to “work commitments” this mini-festival almost made up for it; there’s nothing quite like long queues for over-priced food and drink and even longer queues for truly awful temporary toilets! Needless to say, we saw a few blokes taking leaks into the cardboard beer cups (one even dropped his pants to give us the pleasure of seeing his bare arse whilst doing so) and I’m pretty sure we saw several of those piss-filled cups being launched over the crowd. Anyway – leaving the piss to one side – the gig was truly awesome! The Parrots played non-stop Beatles hits earlier in the afternoon to get the crowd warmed up. 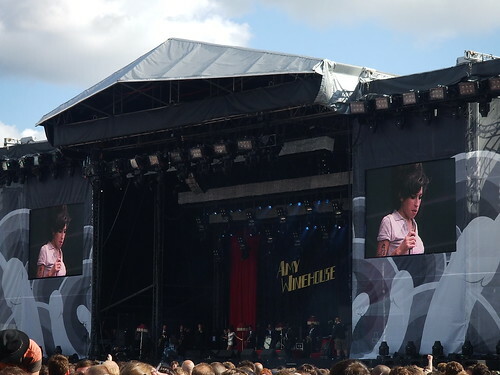 Amy Winehouse came on stage and got the crowd singing along to some of her more popular tunes like Rehab and The Zutons’ Valerie. (Much to my disappointment, she didn’t seem that wasted.) Although we couldn’t really see them as we were having a hot dog at the side of the grounds, The Coral still sounded great and belted out some cool tunes including their classic hit In The Morning. 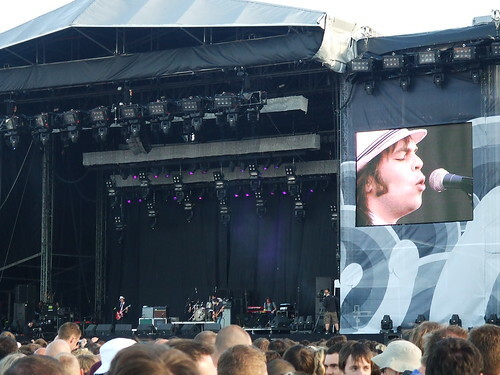 Supergrass played some of their classics too – including Strange Ones, Richard III, Moving, Grace, Caught By The Fuzz and Pumping On Your Stereo – but they also tried to push some of their newer stuff which sounded a bit dull by comparison. That wasn’t helped by the fact that their levels were a bit messed up which meant you could hardly hear the vocals, which was a shame, but they were still great to watch. 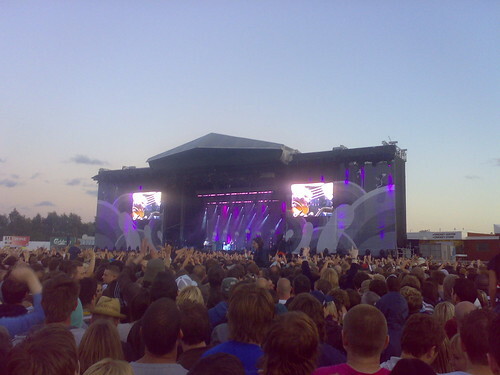 After watching clips from Arctic Monkeys music videos, showing various places in and around Sheffield, they finally came onto their understated stage setup. What they lacked in fancy stage sets and props, they certainly made up for with their music when they kicked things off with Fluorescent Adolescent, I Bet You Look Good On The Dancefloor and Brianstorm, Dancing Shoes, From The Ritz To The Rubble and Fake Tales Of San Francisco. Then they appeared to quite literally blow a fuse, causing all amps, lights and the big screens to die. After a couple of attempts were made to fix things, they were soon running on all cylinders again. As expected, we only heard the odd bit of banter from the usually quiet front-man; we were a ‘lairy bunch’ according to Alex Turner, even lairier than previous night’s crowd apparently. It’s a shame a couple of people right next to us were a little too lairy and started a fight, but they soon calmed down after punching each other’s lights out, allowing us to carry on watching the gig without the fear of getting caught up in the middle of it. As the darkness closed in, they continued to play tune after tune after tune from both of their brilliant albums. Favourites of mine included You Probably Couldn’t See For The Lights But You Were Staring Straight At Me, Teddy Picker, Mardy Bum, Do Me A Favour, The View From The Afternoon and When The Sun Goes Down. Anticipating that 50,000 people all trying to flag down taxis wouldn’t be very much fun, we finally decided to make our way to the exit as they played their encore, just managing to catch the final track off their latest album, the mellow 505, before leaving the grounds. You can view the rest of our photos on Flickr. If Amy Winehouse was not totally plastered I would have asked for a partial refund! !